Organizing your spice cabinet doesn’t have to be tricky. If you follow these easy organization tips, you’ll be able to find any spice you need in your kitchen when you need it. When was the last time you went through your spice cabinet? We’re willing to bet that it’s been awhile. We use our spices almost every day, yet this is one of the spaces that is often forgotten about! Let’s look at 10 super simple ideas that will help you organize your spice cabinet like a pro. Spice cabinets are the easiest ones to get disorganized. These 10 simple spice cabinet organization ideas will help you whip your spice collection into shape. You’ll soon be able to find every single spice you need – even the ones you only use for that one really rare recipe – without spending lots of time sorting through a ton of loose jars. The first tip for a super organized spice cabinet is to use tins to organize similar spices together. The Dollar Tree has great tins that can be used for organizing your spices. 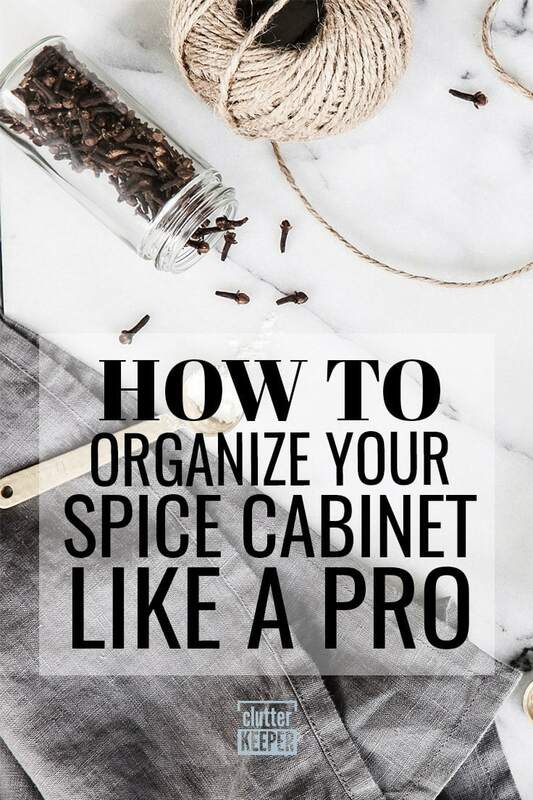 You can use these to stack your spices in your cabinet or make them magnetic and hang them on your fridge or the cabinet door for additional storage. Next, consider ditching the spice cabinet and store your spices in a drawer instead. If you choose to keep your spices in a drawer, definitely get some drawer inserts. They are great for those with extra drawer space. Instead of storing them in a cabinet, use a drawer to keep them organized. They allow all your spices to sit in place without moving when you open the drawer. Lazy susans are a great way to store those spices. Keep your spices organized by category or by name and spin to find the one you need. You may need multiple lazy susans so be sure to organize them in a way that you can easily find them without having to turn them all. If you are short on space, consider a pullout spice rack to put inside your spice cabinet. It stacks inside your cabinet and you can easily get to all your spices. How is a pull out spice rack different from a pull out spice cabinet? A pull out spice rack sits inside the cabinet. It can hold multiple spices. You can sort spices in each rack by name, frequency of use, or spice type. Add shelving to your spice cabinet by creating platforms to stagger your spices. This will allow you to see all your spices at one time, and keep them organized. If you choose to install staggered shelves inside your spice cabinet, label the tops of the spice lids with their names. This way you can easily see every single spice name without having to pull everything out. If you are short on space, consider hanging your spices instead of setting them in the spice cabinet. This will free up space for cooking oils and other essentials. You can use command hooks and wire, or a special hanging spice rack to achieve this. Where do you hang up spice racks? Any kitchen wall space will work. Some people love putting the hanging spice rack near the window. Others hang it on the inside of a cabinet door. Be creative and find the space that works best for you. The next tip is fantastic if you enjoy DIY, because you’ll have to make a slight modification to your kitchen cabinets. If you are short on space, a pull out spice cabinet could be the perfect solution! Pull out storage works great for those small spaces in between your fridge and the wall. This will keep your spices right on hand when you need them. If you’re short on space, consider hanging wire shelves and storing your spices in your pantry instead. This is also great for keeping all your food supplies in one area. There are lots of great spice storage solutions you can buy. One of the most popular ideas is to store spice racks on the pantry door. It takes up almost no space at all. If you are struggling to fit all your spices in the spice cabinet, consider taking them out of their original containers. Buying a spice container that is a uniform size will make them easier to store. Want to see an example? Farmhouse on Boone has a seriously envious spice cabinet. All the spices are in matching glass containers, it is beautiful! We all have a ton of extra spices we don’t need. The trick isn’t to store a ton of spices, but to get rid of the ones you don’t need. Limit your spices to only the ones you use and give away any of the ones you don’t. Pay close attention to the expiration dates. Surprisingly, dried spices do expire. After a certain length of time, they lose their potency. So throw away all expired spices. If you aren’t ready to throw away that one spice that you might use someday, consider putting rarely used spices in a container somewhere else. If you only store the spices you regularly use in the spice cabinet, you will free up a lot of space. Organizing your spice cabinet doesn’t have to be tricky. If you follow these tips, you’ll be able to reach and use any spice you need. Organizing your spice rack is a huge accomplishment, but it is only the beginning. Here are more kitchen organization ideas that will give you the kitchen of your dreams. Complete Guide to Kitchen Organization – Start here. Everything you need to know about organizing your kitchen is all in this guide. 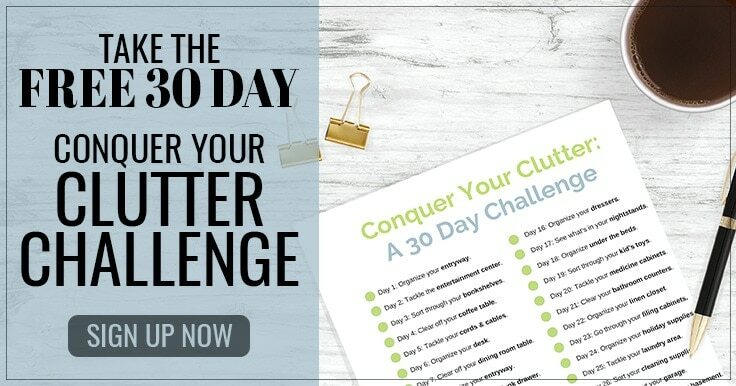 Simple Steps to A Clean & Organized Fridge – Discover hacks and tips for giving you more storage space in your fridge. Kitchen Pantry Organization – Here are 6 simple steps to organizing your kitchen pantry.